West Linn's Brooke Landis did it by the book this year. 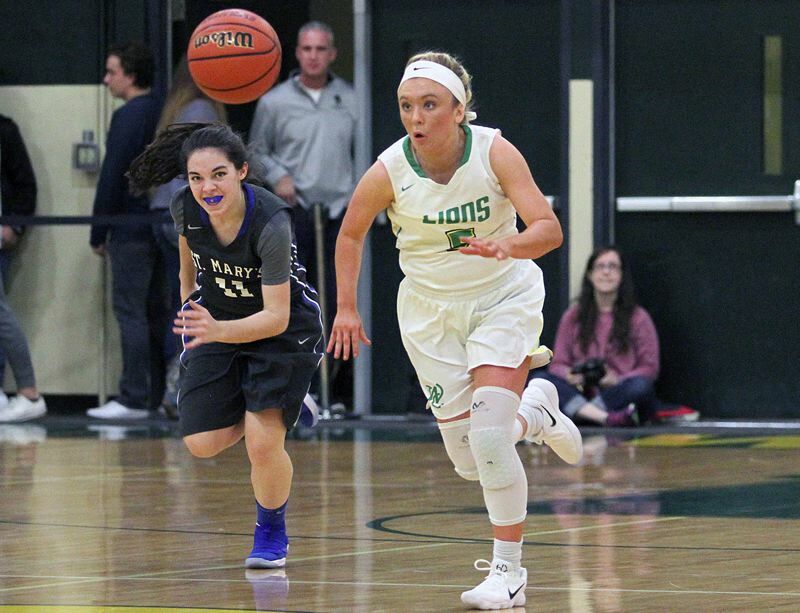 A recently graduated senior guard on the Lions girls basketball team, she led West Linn to a runner-up finish in the Three Rivers League, to a berth in the Class 6A state tournament and eventually, a third-place finish at state. Then, after being named to the all-TRL honorable mention team, Brooke signed to continue her athletic career with the women's basketball team at Notre Dame de Namur University in Belmont, California. Her older sister, Courteney Landis, is a 2015 WLHS graduate who played guard on the Lions girls basketball team, led her senior-season team to a runner-up finish in the TRL, into the state playoffs and within one game of the state tournament. Then, after being named to the all-TRL honorable mention team, Courteney signed to continue her athletic career with the women's basketball team at Linn-Benton Community College in Albany. To that point, Brooke and Courteney Landis had written nearly identical stories in their basketball careers. After that, however, Courteney wrote a new chapter. OK. Let's be honest. After that, Courteney's basketball story included a full addendum of winding, circuitous and bump-filled chapters that brought her to … Notre Dame de Namur and a chance to play college basketball with her younger sister. "The last time we played together was when she was a senior and I was a freshman and I swung up to the varsity team," said Brooke, 18, adding that she plans to study business at NDNU beginning in her coming freshman season. "And now we have two years together where we'll really get to play together," added Courteney, 21, also a business major who's in her senior year academically and her junior year athletically. While Brooke's trip to NDNU was fairly straightforward, Courteney's was decidedly not. Here's what happened following her graduation from West Linn. Courteney, also a soccer player at WLHS, saw most of her twists and turns proscribed for her because of injuries. She suffered her first serious knee injury — a torn anterior cruciate ligament — as a freshman, and while she was able to come back from that and continue her career, her knee was never quite right during the following three years at WLHS. "The knee just kept getting worse," she said. "I just limped after every game. I felt like I need crutches to get around." Because of that continuing pain, Courteney expected that her once-promising athletic career would end when she left high school. "I thought, maybe, 'I'm done,'" she said. And part of her wanted it to end, too, but Courteney's dad, T.J. Landis, and uncle, Myke Landis, had other ideas. 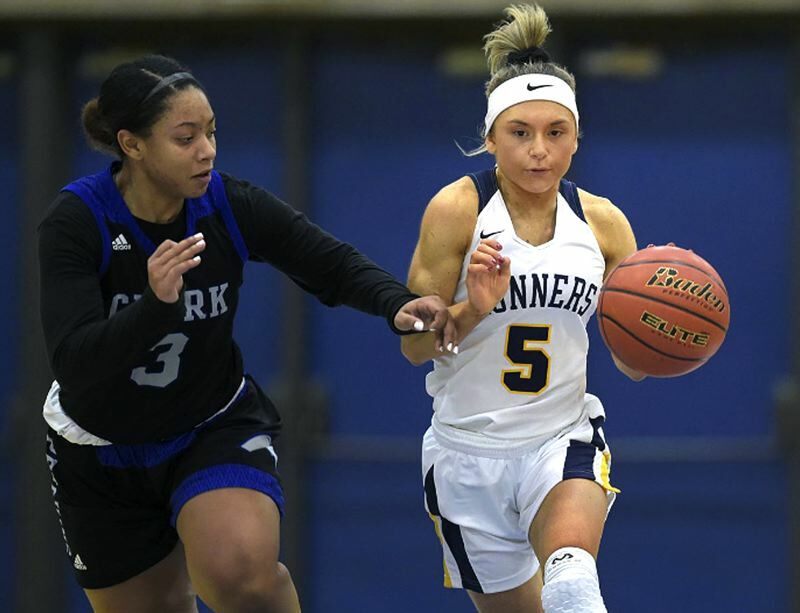 They knew that Linn-Benton was reviving its women's basketball program after a two-year absence, knew that the Roadrunners would need guards and knew that Courteney was too competitive to be done. Linn-Benton agreed, Courteney agreed and she stepped in to be part of the 2015-16 LBCC women's team. She did, that is, for five days before suffering a shoulder injury that required surgery and ended her season. Later that same year, she underwent another surgery on her knee that kept her off her feet for eight weeks and brought her back to West Linn for rehabilitation. After that second knee surgery, Courteney considered — again — whether she had a future in college athletics. But she steeled herself, re-set her sights on college basketball, worked herself back into shape and finally got onto the court for the LBCC women's team. When she did, she proved that it was worth the lengthy wait that preceded it. At the end of the season — a season that saw the Roadrunners make their first trip to the Northwest Athletic Conference playoffs and finish sixth overall — she was named to the 2016 All-Crossover Tournament team and to the All-Southern Conference honorable mention team. There were more challenges ahead, however. Courteney went through yet another shoulder surgery following that season, but came back even better for her second year on the court at LBCC. Academically, she maintained a 3.85 grade point average and was selected for the Phi Theta Kappa Honor Society for a third straight year. On the court, Courteney was named to the All-Tournament Team at the Titan Invitational, broke the LBCC record for most assists in a single game with 13 at the Everett Invitational, finished seventh in the league for assists per game, and 10th overall in the NWAC. Indeed, it was during LBCC's participation at the Everett tournament that NDNU's coaches first saw Courteney play and set the table for her eventual offer. Now, with four surgeries in the past and her first NDNU season looming ahead, Courteney said that she's more ready than ever. "This is the healthiest I've felt in years," she said, crediting her work with ARP (accelerated recovery performance) Wave therapy. "I'm more pain-free than I've ever been. I'm feeling really confident." With her own offer to NDNU in hand, Courteney went to work on the next phase of her — and Brooke's — basketball story. She saw that the Argonauts were going to graduate five guards at the end of 2018 and knew exactly where to get another. "I told them, 'I know you need guards. You should take a look at my sister,'" Courteney said. "They found her and were also in touch with me," Brooke said. "I was at a tournament near (Belmont) and they came to see me play, and they really needed guards so it really helped with the timing." Since then, it's been game on for the two Landis sisters, with Courteney the more experienced, the better passer and better leader, but Brooke the healthier, the better shooter and equipped with better quickness. As competitive as each sister is, each can also appreciate the other's game and abilities. "(Courteney's) really good at distributing the ball, a really good passer and really good as a team leader, bringing the team together," Brooke said. "She's good at shooting the ball, too, and she really just hustles." "The No. 1 thing (about Brooke) would be her shooting. Her release is so quick," Courteney said. "Her 3-point shot is a guarantee … and her feet are so quick. I'll feel really comfortable giving her the ball." But with both sisters headed to NDNU, both headed for the school of business, both playing guard and both working out together this summer, their competitiveness occasionally gets the better of them. "We were playing at ClubSport and I was so upset that I just pulled her hair," Brooke said. "Then we went up to the restaurant (that overlooks to basketball court at the club) to get a smoothie and everyone was looking at us like 'What was that?'" 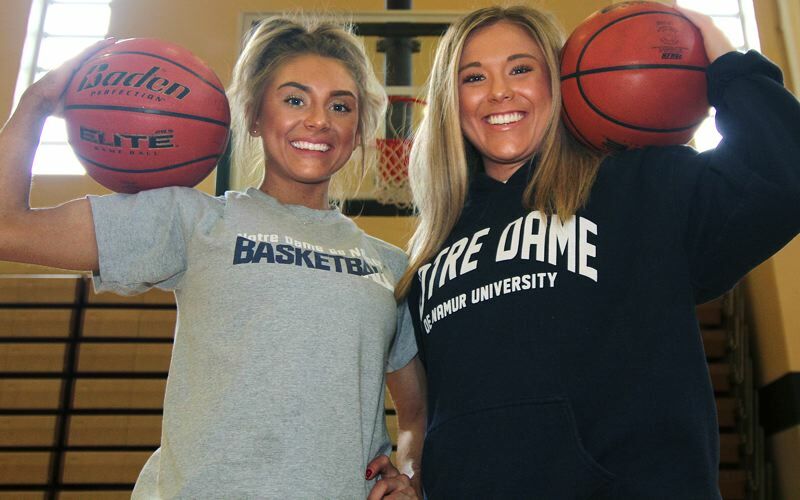 Though parts of their basketball journeys have mirrored the other's, and though both will play guard for the Argonauts and study business at NDNU, Brooke and Courteney remain distinctly unique as individuals. "We each have our definite strengths, but we're not twins," Courteney said. "We're sisters."